Sometimes while enjoying our outdoor trip we do not pay enough attention to keep our possessions from the weather conditions. And in some cases, we could not even predict how the weather will surprise us. Although we are unable to predict it, we could do our best to protect our things from getting wet and spoiled. It is a nasty situation if your expensive things become trash in seconds just because you haven’t stored them safely. And it is quite simple just to put them in a waterproof dry bag. So, we have tried to make the game easy with our picks for the best dry bag for 2019. What is a dry bag? Why is it important to use a dry bag? In simple words, the dry bag is an item, which will keep your gears dry and clean. It can successfully protect your valuable items from water, snow, dust, and sand. So, we can say that it is essential to have one in case you are an outdoor enthusiast. Practically, the most often usage of the waterproof dry bags is for kayaking, canoeing, boating, and fishing. However, dry bags are also often used for hiking, camping, cycling, motorcycling, skiing, and many other sports. The major part of the dry bags on the market are produced of waterproof materials and have welded seams. Most of them have either a roll-top closure system or zipper seal closing. With all these features the dry bag could become your best friend for your outdoor trips. However, you should also be aware that even the highest quality dry bags have some depth limits and should not be submerged for a long time. So, if there is a danger for such circumstances, it is a good idea to have additional protection for the electronics and other sensitive gears. How to choose a dry bag? You should be aware of what you are planning to use your dry bag. If you are planning heavy usage in tough weather conditions or watersports, probably, you should look at the heavy duty waterproof dry bags. The material is very important for the efficiency, weight, and durability of the dry bag. Actually, vinyl and nylon are the most used materials for the production of dry bags. Typical for the vinyl is that it is sturdy and durable. On the other side, the nylon material is lighter and more flexible. It is very important to consider the size when you are going to purchase a dry bag. The smaller bags are light and easy for transportation. However, if you need space for more gears you should look at the larger and, of course, heavier rucksacks. The 5L dry bags are perfect for storing of small items like electronics, first aid kit or some toiletries. However, the 10L bags will provide you with the opportunity to add a change of clothes and some clean towels. Hence, the larger 30L dry bag options could store the gears of 2 people for a day or two. Finally, the dry bags with sizes of more than 30L could offer space for your items in case you are planning a longer trip outside. Most of the dry bags on the market have a roll top closing system or zipper seal closing. The roll-down top system has a higher waterproof efficiency. The sealing of the bag is achieved with the combination of a roll top and a snap buckle. 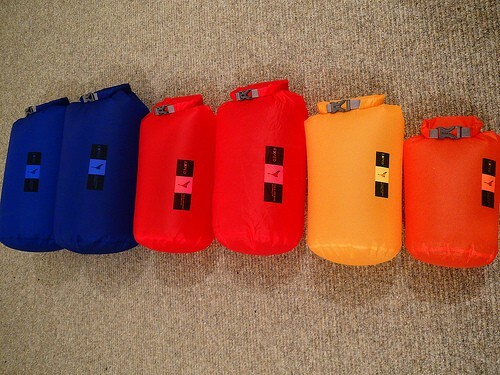 However, in practice, many dry bags are equipped with the press and seal zipper mechanism. Its advantage is that it is simple and easy to use. When choosing a dry bag you should pay attention if it comes with shoulder straps and D-rings. Many dry bags on the market have adjustable and removable shoulder straps. And, there is a simple reason – they are very useful for easy carrying and transportation. Also, the D-rings will be very useful for you if you want to attach the bag to your boat or want to attach it to other bags. It is always good to look for a product that is from a reputable brand. It is not only due to the label, it is also due to the fact that the brand is associated with quality. So, buying a product from a popular brand with excellent customer reviews could be a sure bet. Adventure Lion Premium Waterproof Dry Bag is a high-performance dry bag specifically designed for kayaking, boating, and camping enthusiasts. It is made of sturdy 500D PVC, known as an extremely reliable waterproof polymer. Additionally, it has a roll-top closure system providing solid protection from the water penetration inside the bag. Due to the high-quality materials used this dry bag remains soft and flexible even in cold weather and maintains the high level of protection. Adventure Lion Premium Waterproof Dry Bag is in 4 different sizes – 5L, 10L, 20L, 40L and plenty of colors. The 5L waterproof dry bag is suitable for storing some electronics, food, and drinks. However, the bigger 10L dry bag could provide you with additional space for clothing and toiletries for 1-2 people for a day trip. In case you are planning a trip for more than a day you should definitely consider the 20L or 40L waterproof dry bags. This dry bag comes with adjustable shoulder straps which makes it easy for carrying and transportation. Even if it is heavily loaded the comfortable shoulder slings will ease the transportation. Concluding on the above, we can say that Adventure Lion Premium Waterproof Dry Bag is a premium quality dry bag, which is produced from sturdy materials and extremely reliable for protection from rough water conditions. So we consider it one of the best waterproof bags for kayaking, boating, and other outdoor activities. Looking for the best dry bag we cannot miss the Earth Pak -Waterproof Dry Bag. It is produced from the above mentioned tough 500D PVC and provides excellent waterproof protection even for hard users. As this is a roll-top dry bag, it promises ultimate waterproof protection. As recognition for its durability and quality, the Earth Pak Waterproof Dry Bag is endorsed by Tim Ferris of New York Times in his blog. Earth Pak have options for its waterproof dry bag in different sizes – 10L, 20L, 30L, and 40L. The most popular and suitable choice for casual travelers is the 10L dry bag. It is spacious enough to cover clothing, toiletries and some food and beverages for a day trip. In case you need more space for your gears or traveling with your family then you should definitely choose one of the larger bags. The bag is very easy for use and transportation. The smaller bags (10L and 20L) come with 24-42 inch single shoulder strap. However, the larger options (30L and 40L waterproof backpacks) have backpack style shoulder straps that also come with a sternum strap for additional stability. The bag has also very good designed and it is really good looking. You can choose from several different color options and be stylish during your outdoor trip. And it comes with PX8 Certified 6.5 Inch waterproof phone case as it is always a good idea to add a second layer of protection for your expensive electronics. All in all, Earth Pak is a stylish and high performance waterproof dry bag that guarantees to keep your belongings dry. It is very durable, easy to use and transportation and maybe this is the reason for its customer great rating on Amazon. Unigear Waterproof Dry Bag Sack is a product of Unigear. It is a well-known brand on the outdoor market with its high-quality and durable gears. The bag is made of tough polyurethane coated nylon, which is abrasion and puncture resistant. It is designed with durability and safety in mind and it will keep your valuable possessions water, dust, and sand. The roll-down top closure system offers added burst resistance and a waterproof seal. Although it is very durable and efficient, the Unigear Waterproof Dry Bag Sack is also really lightweight. And, you will carry and transport it easily as it comes with a removable and adjustable shoulder sling. Furthermore, the producer has added a universal phone bag to the package. This waterproof phone bag fits all smartphones up to 6 inches and protects them against water, snow, and dust. Unigear offers its dry bag in several different sizes (from 2L to 40L) and colors, so you can choose the one that best suits your needs. The most commonly used 10L dry bag could comfortably fit your clothing and some snacks for a day trip. If you are thinking about an overnight trip you should look at the larger waterproof rucksacks. Overall Unigear Waterproof Dry Bag Sack is a real bargain. Although it is both durable and lightweight, it comes at a really low price compared to many other waterproof dry bags on the market. With all these features this bag deserves a place in our selection for the best dry bag for 2019. Såk Gear is a recognized brand, popular with its high-quality products and simple designs. That’s why their Såk Gear Premium Waterproof Dry Bag is one more item we should include in our waterproof dry bags review. It is made of heavy duty 500D polyester, coated with vinyl to keep water out. This high-quality material makes the bag very durable and reliable while keeping it lightweight. The roll-down top closing system provides a secure waterproof seal. Furthermore, the dry bag has welded seams, which will seal out the water, snow, dust, and sand. So, you can enjoy your trip without worries about your valuables. Other positive of DrySak Premium Waterproof Dry Bag is the exterior splash-proof pocket with zipper closing system. You can store there your wallet and keys, so, you would not open the dry bag just because you need a key. Of course, this zipper closed pocket is not as waterproof as the main dry bag. And, if you decide to store your electronics there, you should use some additional protection for them. If you decide that Såk Gear Premium Waterproof Dry Bag is your dry bag, you can choose between the 10L and 20L option of the product. The 10L waterproof dry bag could fit perfectly your clothes and electronics. Hence, the 20L option will provide more than enough space for the essential gears of two people. Also, the bag is easy to carry and transport as it comes with a comfortable shoulder strap. Last but not least, depending on your personal taste and style, you can choose one of the many colors available. Finally, we can conclude that Såk Gear Premium Waterproof Dry Bag is a durable waterproof dry bag. And, its high-quality and efficiency is recognized by its users in their customer reviews on Amazon. SealLine Baja Dry Bag is another very popular product that deserves attention if you consider buying a waterproof dry bag. It has 19oz. scrim-reinforced vinyl sides and heavy-duty 30oz. vinyl bottom. Additionally, the tough vinyl is puncture and scratch resistant. Since the materials used are of top quality, this dry bag is very durable and promises to last for years. Furthermore, it has a roll-top closure system, which makes a watertight seal, ensuring that the water could not seep into the bag. Although it is very durable, the SealLine Baja Dry Bag is light and easy to carry. However, a minor drawback is that the bag does not come with a shoulder strap. On the other side, it has a D-ring, which is very useful in case you want to attach the bag to your boat. SealLine Baja Dry Bag comes in a variety of sizes and colors. You can choose between six different sizes, namely 5L, 10 L, 20 L, 30 L, 40L, 50L, and 55L. The colors offered are black, yellow, blue, green and orange. So, you can choose the size and the color that suits you best and keep you trendy. Without further ado, SealLine Baja Dry Bag reviewed above will serve you exactly as promised – will keep your items safe and dry. It is durable and sturdy, it is lightweight and easy to use. So, we consider you will not disappoint if you try SealLine Baja Dry Bag. Good Post! Thanks for recommending!